Born and raised in Jackson, Mississippi, the author, Kathryn Stockett, grew up in a privileged family and Demetrie was the black maid she adored. Stockett also grew up knowing very well the rules between blacks and whites. She also knew the lines blacks and whites didn’t cross. 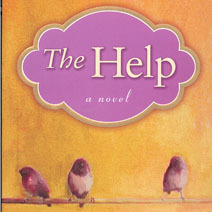 Stockett crossed them all in her novel, The Help. There’s little doubt this engaging novel is autobiographical and historically authentic. It is set in the era of Martin Luther King, Jr., Rosa Parks and marches on Birmingham. Readers will be engaged by the sharply-drawn characters and their amazing passion and strength help to create change. Minny is Aibileen’s best friend. She has a very sharp tongue and way too sassy for her own good. She is a marvelous cook and makes the best caramel cake in Mississippi. She loves her children but has a lousy husband, who drinks too much, works too little and treats her badly. “The worse thing you can do for your career as a maid is have a smart mouth,” Aibileen says of Minny and her large, powerful network of maid friends. One of Aibileen’s favorite refrains throughout The Help is “the help always know,” telling the reader they know a whole lot more about life than the mundane chores of cooking, cleaning, and changing diapers ~ chores their white employers have no interest in doing. Elizabeth Phelan is better known as “Miss Skeeter” because that’s what her brother said she looked like when she was born ~ a mosquito. She grew up on the family’s large cotton plantation and is used to the finer things in life. She’s too tall, gangly, her hair is frizzy and she just graduated from Ole Miss with a degree in English and a Chi Omega sorority pin. Her mother, a member of the Daughters of the American Revolution, would rather see a ring on her finger and a guy waiting in the wings than some pretty college diploma. The plot for the story is presented in the first chapter. While Aibileen is caring for two-year-old Mae Mobley, her mother, Miss Leefolt, is preparing for the Wednesday bridge club and planning to build Aibileen her own toilet in the garage ~ a shack of a private bathroom. This is inspired by Miss Hilly Holbrook’s “Home Help Sanitation Initiative” ~ a disease preventive measure ~ a separate bathroom for blacks ~ that every home in Jackson with black help should have to protect their white employers. “Oh, no, ma’am, everything’s fine,” Aibileen replies. That pivotal question, which winds its way through the book like a ribbon of hope, and Aibileen’s nagging thoughts about Miss Skeeter’s question, are the catalysts for baby steps of change that become the central theme of the book. Miss Skeeter gets a job on the Jackson newspaper, writing a column about cleaning houses, which she knows nothing about. Then, she has a risky idea for a book about “the help” in Jackson and finally gets a nod from a New York editor. Aibileen and Minny, and other maids rally timidly for this clandestine adventure, knowing full well it might change their lives and the town they live and work in forever. It’s a good read, especially after you get accustomed to the Southern dialect and the veiled lingo of the maids. It’s well worth the 451 pages and the time ~ 10 hours for me ~ to read this joyous, triumphant book. You won’t forget the characters or the impact of the story.